Wasps forward Nathan Hughes has successfully appealed against his three-match ban for the incident that left Northampton and Wales wing George North unconscious. 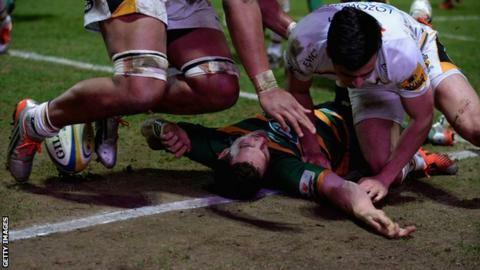 Hughes, 23, was sent off for the challenge during Northampton Saints' 52-30 victory on 27 March. North, 22, suffered concussion and Hughes was suspended. But an independent panel ruled on Friday that "no act of foul play took place". Hughes still missed Wasps' 32-18 defeat by Toulon in the European Champions Cup quarter-final, but is free to play again immediately. It was North's fourth head injury in five months and he will not play in April on the advice of a neurologist.